Many people are used to honey hunting of wild bee colonies in the forest. But due to over-exploitation of the forest resources, there is a decreasing trend in the quantity of colonies in many areas of our forests. Instead of honey hunting, beekeeping as a livelihood had been introduced. Beekeeping will not only augment family income of upland dwellers and indigenous communities from bee products but also motivate them in the protection and development of forest resources. Beekeeping will also ensure good quality yield of crops through pollination thus, leading to an improved regeneration of trees and promote a good floral diversity. The integration of beekeeping in the forest plantations and agroforestation projects will ensure the success of such projects. This manual on beekeeping will help the upland dwellers and the indigenous communities in providing additional livelihood aside from promoting a balanced ecosystem. In order to become a successful beekeeper, it is important to know your bee colony, their behavior and needs. The bee colony is composed of the queen, the drones and the workers. A strong colony of Apis mellifera of 14 frames could have a population of 50,000 workers, a queen, a few drones, 6,000 eggs, 10,000 larvae and 20,000 pupa. The queen is the female parent of the colony. Her role is only to lay eggs in the colony. A queen lays 1,000 to 1,500 eggs a day. Pheromones produced by the queen is responsible for the coherence of the colony. The drones are the male bees responsible for mating. Drones are larger and stouter than queens or workers. Worker bees are the smallest and the most numerous members of the honeybee colony. They are underdeveloped females with small ovaries and are not capable of producing eggs under normal conditions. The workers are responsible in feeding newly hatched larvae with royal jelly. Worker bees collect pollen nectar, propolis and water and bring them to the hive. Some worker bees remain to guard, clean and build wax combs. These also include the nurse bees that feed the young and queen, and regulate the temperature of the hive. The bees need wax, nectar, water, flowers, trees and flower buds in order to live. They build a wax comb to store honey and pollen and responsible for egg deposition. Nectar is liquid, sugary substance produced by flowers and is the raw material from which honey is made. Bees also need water. It is added to the honey and serve to cool the hive during hot weather. Bees need flowers from which they collect pollen. Bees also need trees and flower buds to make propolis which they use to seal cracks in the hive and repair combs. An initial amount of P5,000.00 is required as working capital. The best time to start is during summer. Flowers are in bloom for sufficient source of nectar and pollen. 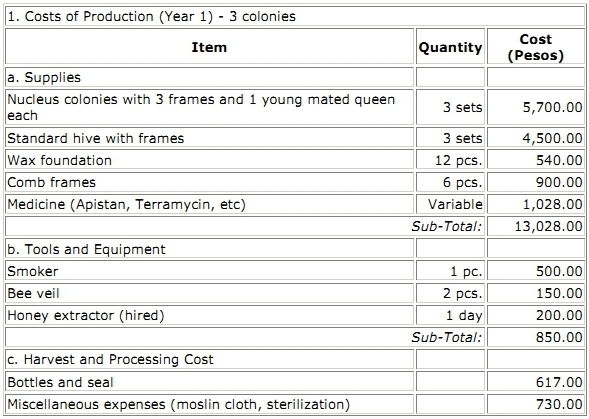 Procure bee colony from reliable source. Usually, a package colony is a three-frame colony. Be sure to check on the following: all stages of broods (egg, larva and pupa) should be present; a young, good laying queen; pollen and nectar. They should be free from mites and diseases. 1. It should be located near an area with abundant nectar or pollen-producing plants. The host plants must be within the 3-8 kilometer radius of the apiary, depending on the slope of the area. 2. It should be near the source of clean water. The bees need water to dilute honey and regulate the temperature inside the bee hive. 3. It should have enough windbreaks especially during typhoon seasons. 4. It should be far away from areas with high pesticidal/insecticidal spray or usage. During the summer months, the colonies must be placed in shaded areas. During cold months, the colonies should be partially exposed to sunlight. 1. Bee veil – This is used to protect the neck and face from bee sting. A veil is made from any wide brim and hat and a piece of mosquito net, moslen cloth and screen. 2. Smoker – This is a metal can (often bellows attached) which is used to generate smoke for subduing honeybees. Materials like wood shavings, cow dung or dry leaves are lighted nearest the mouthpiece so that smoke is filtered through the unburned fuel. 3. Gloves – This is used to protect hands from bee sting. Gloves used in beekeeping are usually of the “worker type,” often made of soft leather and canvass-type cloth. Sleeves are sawn to the gloves top to protect the beekeepers from bee sting. The sleeve can be tightened to the arms by the use of a string or elastic bands. 4. Hive tool – This tool is used to help move apart the hive frames inside the bee colony. It can be purchased from bee equipment company or made by a beekeeper from a metal, which is eight to ten inches long. The sharp edge is used for scraping wax and propolis inside the hive. 5. Bee brush – A brush or whisk broom used for removing bees from comb. 6. Bee hive – A container provided for honeybees to nest in. The standard bee hive can be obtained from factory specializing beekeeping equipment. However, a beekeeper can also make a hive using the standard size. 7. Frames with foundation – A frame with a foundation sheet is embedded to the hive, where honey comb is built-up for honey storage and bee multiplication. 8. Extractor – A cylindrical drum with at least 2 frame containers inside into which a handle is attached and driven manually to create centrifugal force which spills out the honey from the encapped honey comb. 1. Use bee veil to avoid sting. 2. Do not stand in front of the hive, the foraging bees will be blocked. 3. Remove the outside cover gently. You may not use a smoker when bees seem to be gentle. When smoking is necessary, gently smoke the entrance of the hive. 4. Lift the upper cover gently and puff another smoke. 5. Remove one frame, inspect both sides. Examine the rest of the frames and return to their original position. This refers to increasing bee population needed for increased honeyflow. a. Division board feeder – The sugar syrup is poured into the provision board and at the same time the feeder box. This type of feeder needs floaters. b. Bottle feeder – Mix a sugar syrup in a clean bottle with small holes on the cover and place it upside down position in a bottom board. c. Polyethylene bag feeder – The sugar is placed in a plastic bag and pinch with a hole and placed on top of the frames/hive. a. Never feed when it is raining. b. Reduce the entrance of the bee hives. c. Take great care not to spill sugar syrup in the apiary, this will cause robbing. d. See to it that feeders are not accessible from outside. 2. Addition of empty comb – To increase population, the space for the queen to lay her eggs must not be restricted. However, if the space is more what is needed, this must be avoided. The addition of empty comb must have proper timing. 3. Brood support – A colony or hive with few worker bees need support of either sealed or brood bees to maintain the moral of both worker and queen bees. Queen will lay eggs when few bees are available to take care of what she laid and clean the cell for her to lay eggs. Brood support can be from other colony of the same strain and known to have been free from diseases. The bees forage are nectar, pollen, propolis and water. The locations where the honeybees go and collect nectar, pollen and propolis are called bee foraging/pasture areas. These areas should contain diverse species of vegetation such as forest and fruit trees, shrubs, grasses and weeds, herbs and other agricultural crops that provide benefit to honeybees, man and environment. Bees can fly 14 kms to a food source when no intervening forage is available. However, the colonies lost weight. When colonies are located 0.75 to 1 km from the food source, they show gains as large as the colonies located at the source provided the weather is favorable for the bee flight. At least two (2) chamber per hive are prepared for honeyflow. The queen must be prolific and strong to withstand the need of the colony. In areas. With longer nectar flow duration, brood support is necessary to utilize to the maximum nectar before it will be mated. The parasitic beemites, V. jacobsoni and Tropilaelaps clarae are the most serious pest of bees, especially A. mellifera. If the colonies are not properly managed, all the bees will be wiped out. The most commnly used acaracides are Folbes (chlorobenzilate), smoking paper (Tetradifon) and lately Apistan (Fluvalinate). Farmers utilize botanicals like “alagaw” (Premna odorata), sometimes combined with lemon grass (Andropogon citrates) and Tobacco (Nicotiana tabaccum). The leaves are placed inside the hive and replaced weekly during heave infestation. The percentage of control is only about 35 percent. Some beekeepers reduce brood sizes and hives manipulation to break the cycle of the mites. Wax moth (Galleria sp.) is a threat to A. cerana colonies. Hygienic practices like cleaning bottom boards, keeping unused combs and burning infested wax can minimize infestation. Predatory birds, like swift (Chaetura dubia) and “pirik-pirik” (Merops sp.) can considerably reduce the population of forager bees. Based from personal observation, one swift could eat as much as 300 bees. The best control so far is placing a net trap in the apiary. It is also advised to disperse the colonies by 10-20 hives per site to be less noticeable by the birds. A beekeeper analyzed the guts of swift and found that honey bees are chief diet. The wasps (Vespa sp.) are common predators of A. mellifera. One wasp could take as much as 7 bees at one attack. Traps are installed in case of high wasp population. In small apiaries, the wasps are destroyed mechanically by hitting them with slippers or piece of wood. They are also caught using insect nets. Other minor pests are toads, ants, frogs, lizards and cockroaches. Chalkbrood is caused by fungus (Ascosphaera apis) which affects the larvae-after infection. The larvae become “mummified” and are either white or gray to black in color. 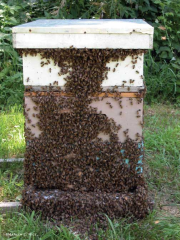 The protection from high levels of infection are the use of young productive queens, new comb, strengthening the colonies and good colony management. A viral disease, sac brood has been observed from bees sampled from Cavite. No specific form of treatment is known for sac brood. Only a small proportion of the total amount of brood is normally affected. In sever infection, requeening is recommended or removal of infected brood. The parasite, Nosema apis is found in colonies from Cavite. This parasite is common during rainy season. Adult bees from infected colonies should be transferred on the clean combs. Partial replacement of combs may also be done. Anerican Foul Brood (AFB) and European Foul Brood (EFB) are bacterial diseases which affects the bee colonies during spring or summer. These diseases are not common in the Philippines. The EFB can be controlled and prevention can be done by feeding the colonies with oxyletracycline hydrochloride (e.g. Terramycin). While AFB infected colonies are burned. Pesticide poisoning had also been considered as threat to beekeeping. The pesticide poisoning of bees are caused by the application of insecticide to crops that are in bloom, bees coming in with insecticide residues, drift off, chemical sprays on flowering crops or apiaries and contaminated nectar and pollen. The symptoms of pesticide poisoning is exhibited by the large number of dead bees in front or near the hive entrance that result to sudden dwindling of adult bee population. The beekeepers should be aware of the location of the apiary and migration of bee colonies to avoid poisoning of bees during the bloom period of crops. There are two methods of harvesting honey. The first is selective harvesting by ripe frames and the other one is harvesting once about the end of honey flow. The type of harvesting practices are dictated by the type of plants. The honey is extracted from the frame with the use of centrifugal honey extractor. The honey produced is transferred to sterilized bottles, sealed and labeled for market. There is no problem in marketing, you can sell the honey in groceries, bakeries, meat processors (using honey), and pharmaceutical companies. Colony used for honey flow can either be maintained in a standard box or splitted into nucleus colonies depending on the next purpose of the colonies. Feeding should be done to maintain the moral of bees. Colony that were used for the honey flow should be fed to avoid the colony from collapsing. 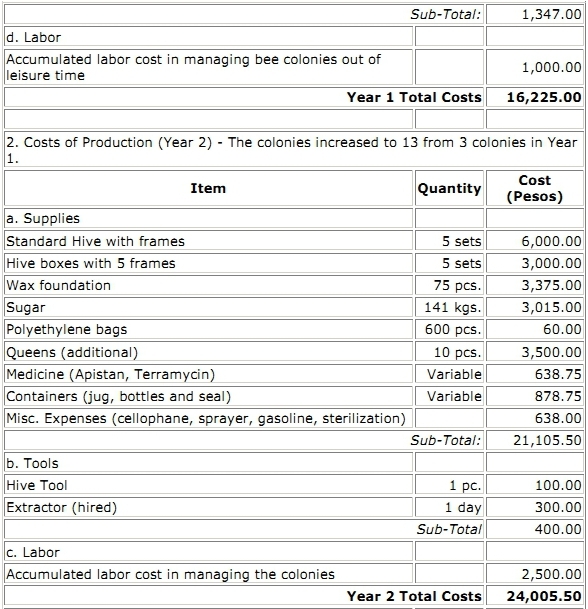 The costs and returns of beekeeping is presented in Table 2. Table 2. Costs and Returns for Year 1 and Year 2. Attenga, G.M. 1995. Honey Hunters and Beekeepers. A Study of Traditional Beekeeping in Babati District. Tansania Sweddish University of Agricultural Sciences. International Rural Development Center. Cervancia, C.R. 1995. Beekeeping for Beginners: The Biology and Behavior. Lecture on Seminar-Orientation on Beekeeping with Common European Honeybee for Northern Luzon (Unpublished). Laquidan, R. 1995. Honeybee Products, By-products and its Potential in the Philippines. Lecture Seminar-Orientation on Beekeeping with Common European Honeybee for Northern Luzon (Unpublished). Ramos, F. V. 1995. Implementing Guidelines for Operationalization of Social Reform Agenda Convergence Policy. Manila, Phil. 1994. The Social Reform Agenda. Republic of the Philippines. Santos, A.S. The Beekeeping Module. A.S. Santos Apiary and Bee Supply. Marikina, M.M. Philipppines. Sito, A.P. 1995. Hive Management. Seminar-Orientation on Beekeeping with Common European Honeybee for Northern Luzon (Unpublished). Sito, A.P. et al. 1995. La Union Technoguide on Beekeeping. ATDC-DMMSU, P.A. Svensson, B. 1991. Bees and Trees. Sweddish University of Agricultural Sciences. International Rural Development Center. pp. 123. Tamayo, R.C. 1990. Lecture Notes, Training on Apiculture (Beekeeping) in the Highlands. (Unpublished). Source: DENR-CAR, 1997. Technology Transfer Series, Vol. 7(1). Hi. I’m interested in having my own apiary. I would like to know where to purchase the supplies, tools, and equipment needed to start my very own apiary.